One of the simplest, delicious and economical traditional French dishes you can make is gratin dauphinois. What's not to like about creamy slices of potato? The first layer of potatoes and seasonings. Tim and Pauline gave me a big bag of last year's potatoes that needed using up. I'm already eating new potatoes from les Jardins Vergers de la Petite Rabaudière, but the old potatoes are still in good condition thanks to Tim and Pauline's careful husbandry. They are a variety called Stemster (or Prospère in French) which I have grown myself in the past and really like. They are ideal for a gratin. Creamy milk added and dusted with nutmeg. 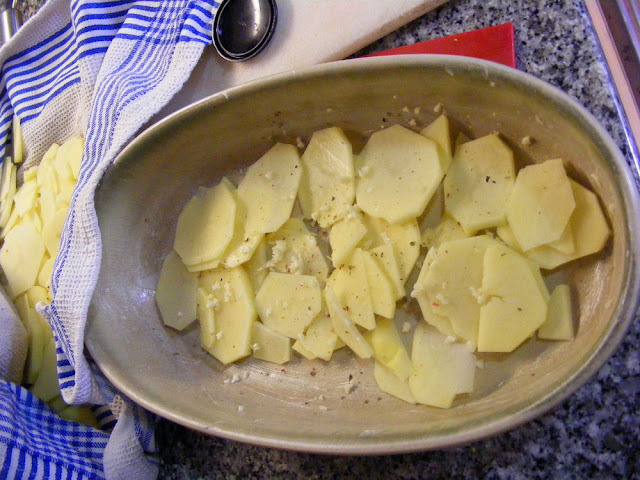 Finely slice the potatoes into disks. Butter a gratin dish and turn the oven on to heat to 150C. 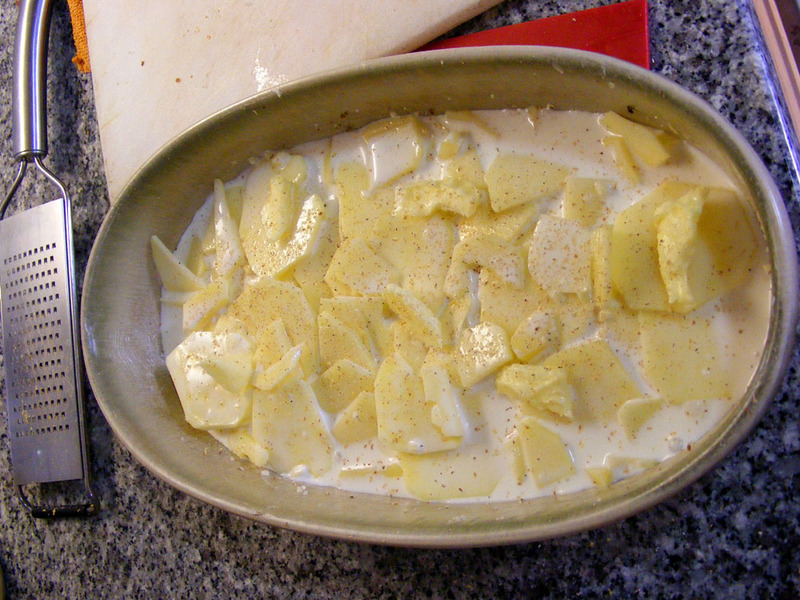 Put half the potato slices into the dish, spreading them out so they form an even layer. Season with salt and pepper and sprinkle with half the garlic. Repeat with the rest of the potatoes and seasonings. Mix the milk and cream together and pour over the potatoes. Grate a hint of nutmeg over the top and dot with flecks of butter. Browned on top and surrounded by creamy goo. Gratin dauphinois is one of my favorites and it is absolutely delicious. My English mother made what she called scalloped potatoes in just that way but she added very thinly sliced onions...no garlic. They were wonderful served with sliced leftover meat of any sort. Sheila, my mum used to make scallops too, as an occasional treat. Sliced potatoes with onions, butter and Oxo stock. Delicious! 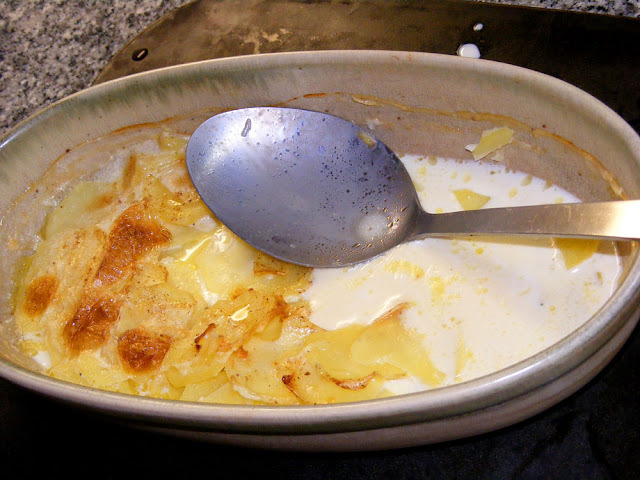 Another good gratin is called pommes boulangère — potatoes sliced and cooked this way, but with chicken or other broth, onions, and herbs instead of milk and cream. Cheese is optional. Yes, I do pommes boulangere from time to time, usually with leeks and no cheese.